Big turnout expected for paid sick days at City Hall — will you be there? This is it – now is your chance to urge the Seattle City Council to support healthy, responsible prevention by passing a paid sick days ordinance! When: TOMORROW! Wednesday, July 6th, 5:30 p.m. – 7:30 p.m.
We’re filling the Council Chambers with supporters — RSVP here to make sure our crowd spills into the halls! We need an outpouring of popular support to overcome the influence of well-heeled opponents who are lobbying against paid sick days behind the scenes. Please turn out in support of paid sick days — and bring your friends! Even if you can’t make it to the hearing, you can still make a difference. Use this link from MomsRising.org to send a message supporting paid sick days directly to the City Council. To be most effective, be sure to customize your message to say why paid sick days are important to you and your family. This entry was posted in Paid sick days, Testimony and tagged nick licata, public hearing, seattle city council. Bookmark the permalink. 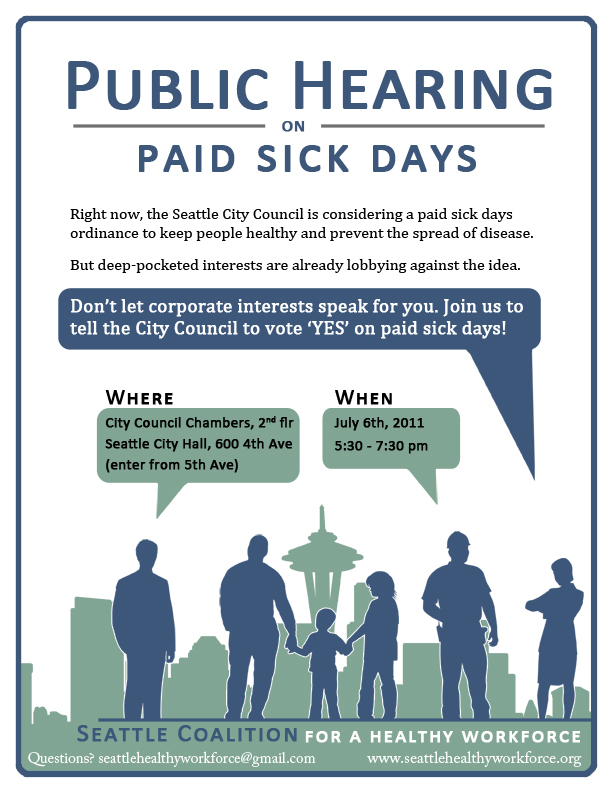 1 Response to Big turnout expected for paid sick days at City Hall — will you be there?